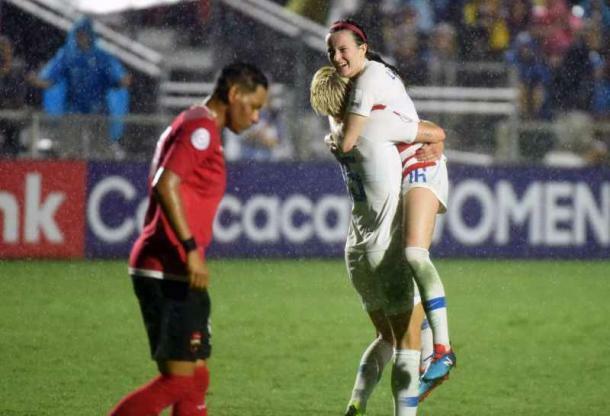 An easy win for the US leads them to the next stage of qualifying at the CONCACAF Women's Championship. 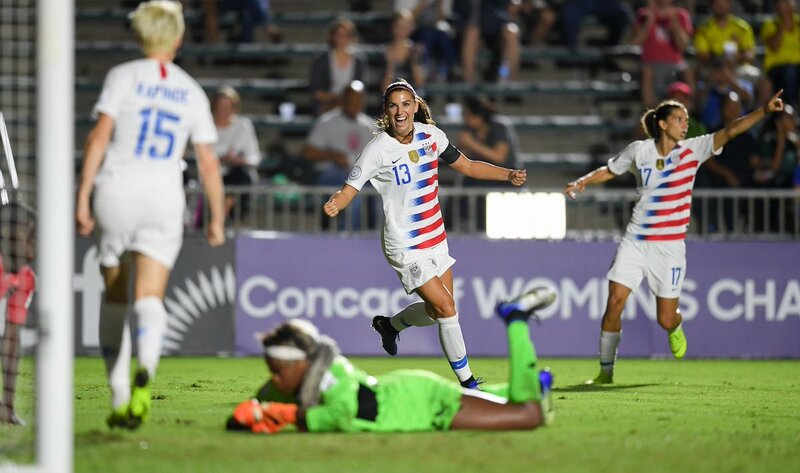 The United States Women's National Team put seven goals past Trinidad and Tobago on Wednesday night to secure their place in the next stage of the CONCACAF Women's Championship. Alex Morgan and Rose Lavelle​ both got a brace on a night that the USWNT finished top of their group as well. The four-nil lead going into half-time was no more than the US deserved. In fact, had it not been for some great saves from Saundra Baron and the posts and crossbar, the scoreline would have far worse for Trinidad & Tobago when the half time whistle blew. Morgan got things going for the US early when she neatly finished into the far corner of the goal from close range after being picked out by Julie Ertz' square ball. After that, Morgan could have added more to her total had it not been for the crossbar, post and Baron on three different chances. Eventually, the USWNT's pressure eventually told as they cycled the ball well all throughout the first 45 minutes. Rose Lavelle was the next to get onto the scoresheet when she came onto the ball from just outside the box and curled it beautifully past the goalkeeper. Two minutes later, Lavelle got her second when she got onto a loose ball in the box and finished well from six yards out. Crystal Dunn then poured on the misery for Trinidad and Tobago just before half time when she was in the right spot to capitalize on another loose ball and score from the top of the box. Trinidad and Tobago barely troubled the US and spent most of the half trying to shut down the spaces near their goal and stopping the onslaught coming their way in the torrential rainfall. Unfortunately for them, the US found their ruthlessness in front of goal as the half wore on and proceeded to punish the West Indies nation. After letting in so many goals in the first half, Trinidad and Tobago had no more gas in the tank so to speak. This allowed the US to continue to control the tempo of the game and go for goal whenever the opportunity arose. The home side added three more goals to their total and could have had more if their finishing had been better. Lindsey Horan added her name to the goal scorers early in the second half as she went for goal from about 20 yards out. That goal was immediately followed by Morgan's second as she pounced on the rebound of Baron's save from Tobin Heath. Heath finished off the scoring for the evening eight minutes later as she had a simple finish from right in front of the goal after she was picked up by Megan Rapinoe. The USWNT continued to create chances for themselves and substitute Samantha Mewis had more than one chance to herself a goal as well but could not convert. In the end, seven goals proved to be all the hosts would get against a tiring Trinidad and Tobago side and booked their place in the semi final match of the qualifying competition. Morgan (min. 9), Lavelle (min. 41), Lavelle (min. 43), Dunn (min. 45), ​Horan (min. 49), Morgan (min. 50), Heath (min. 58). United States of America:​ Naeher; O'Hara (Pugh, min. 71), Dahlkemper, Sauerbrunn, Dunn; Lavelle (Lloyd, min. 46), Ertz, Horan; Heath, Morgan (Mewis, min. 61), Rapinoe. Trinidad & Tobago: Baron; Belgrave, St Louis, Shade, Russell; Forbes, Francois, Hinds (Hutchinson, min. 46), Cato (Henry, min. 12), Guerra; Stoute.